Being back in Las Vegas brought back some strange memories from the year I spent living there right after graduating college. I usually explain this year as just a gap of discovery and absolute weirdness, I'm still not sure it really even happened. For all of you who have been to Las Vegas before I'm sure you understand when I say that Vegas is one of those place you go to visit but are happy to know you will be leaving. My time in Las Vegas was my first attempt at being an adult and I guess you can say that I learned a lot. Because most aspects of my life at that time were a bit up in the air, I began turning to the kitchen for comfort and a sense of control. I started cooking and baking things I had never attempted before, there wasn't a day that would go by without fresh baked goodies on the counter and a full dinner on the stove top. I turned to my mom for some help, she is an amazing cook and as a child we had fantastic dinners almost every night, I wanted to recreate some of her favorites. I made my first batch of chicken adobo, although it wasn't as good as hers I have to admit it was pretty delicious. Amongst these phone calls for recipes my mom gave me one for sour cream scones, these weren't something she had made us before but they sounded like they were worth a try. Boy am I glad I did because they are freaking awesome! Super light and delicate and just slightly sweet but most importantly easy to make. I've had scones on the brain since our trip so I whipped up a batch of blueberry ones to get rid of this scone-brain that's been keeping me up at night. I'm pretty sure when I made them in the past I only used white flour so I was pumped when I made them this time around with half whole wheat/half unbleached white and they turned out even better! The original recipe is from Cooking Light, the only change I made was with the flour. Preheat your oven to 400 degrees. Combine all of your dry ingredients into a large bowl and mix thoroughly. In a small bowl mix your wet ingredients. Add your wet ingredient mixture to your dry ingredients and stir until moist, add in your dried fruit. 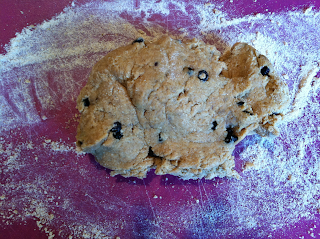 Next it's time to get your hands dirty, knead your dough on a lightly floured surface about 10-15 times. 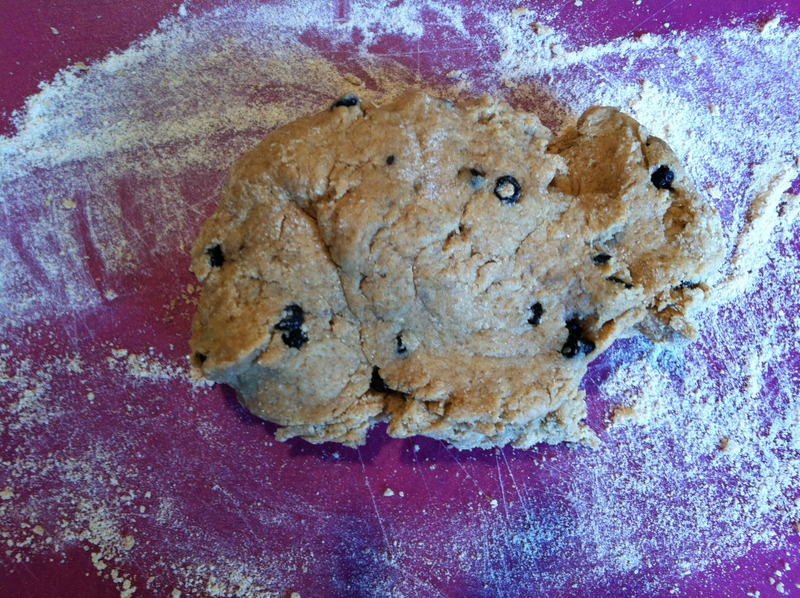 Split your dough into quarters and form into balls, lightly flatten the balls and cut them into quarters. If you like scones or have made them before I highly recommend this recipe, I will never make scones again without sour cream! Love the title! Loved the Scones even more!